Rediff.com » Movies » Disney plays with Toy Story 3! 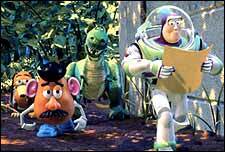 Disney plays with Toy Story 3! In an aggressive show of power, Walt Disney Studios has announced that it will finally go ahead with its long-discussed sequel to Pixar Animation's two Toy Story movies, said Hollywood Reporter. Disney and Pixar have been estranged for a while now, and Pixar, boosted greatly by the phenomenal success of their latest, The Incredibles, can currently afford to play hard to get. The Steve Jobs studio has expressed intent to walk away from Disney, even if it means leaving behind the rights to popular characters the team crafted in unison like Woody and Buzz from Toy Story or any of the bright aquatic toons from Finding Nemo. Disney Chairman Michael Eisner has been trying to realign and cave in, giving Pixar what Hollywood analysts are calling a 'fairer share' of the profits, but the bumpy marriage of the two firms has been getting increasingly strained, conversely because of the giant success their alliance has consistently enjoyed. Their current deal is set to expire next year with the release of John Lasseter's Cars. The Toy Story 3 move brings yet another set of negotiations closer in an animated confrontation that audiences, at least, are bound to enjoy either way!